I may be fairly close to home compared to my classmates who are from places like Long Island and Syracuse, but it doesn’t mean I don’t miss my home. I can’t always click my heels together and flash back to my nice apartment in Dansville. There was nothing more pleasing to find a place that could bring me there, without me having to physically go home. It wasn’t the comfort I was used to. It was absolutely nothing like my messy bedroom, where I could hide away from all the noise and problems in the world, with my fat orange cat. I’m sitting in this coffee shop called “Crickets”, watching the sunset, and it’s like being back at home, but better. There’s like 10 upperclassmen that I don’t know. The espresso machine behind my head is making that whirring sound that usually annoys me, but in that moment it was oddly soothing. The air smells of fresh coffee beans and waffles. I’m seeing this beautifully, talented girl singing and I’m so entranced by the just-plain-awesome environment that I’m not feeling any anxiety, or awkwardness. All of my stresses just seemed to melt away. I didn’t realize how healthy and awesome it was for me to be there until after I left and thought about how truly happy I felt. I felt like I was home, but there was a beautiful Geneseo sunset setting over the valley, the coffee shop was full of people socializing, and my orange cat was nowhere nearby. I can’t tell if it was spending time with two of my super awesome friends who brought me to this coffee shop that released all the dopamine in my brain, or if it was Allison Leah singing the powerful lyrics “Where do hearts go when they need healing? ‘Cause there are no stitches to rid me of this pain I’m feeling. Where do words go when they’re unspoken? ‘Cause I can’t find a way to tell you that I’m broken,” and all of her other wonderful lyrics speaking to me. I guess what I’m trying to say is that even if you miss home, you can find something right in Geneseo that will make you feel the same comfort you felt at home. Maybe you’ll even feel a better kind of comfort. –Tessa H.
Last class, we visited a replica of Henry David Thoreau’s cabin, located on the south side of campus. Living at Monroe Hall, on the North side of campus, I was annoyed to have to walk ten minutes in 60-degree weather–not to mention I did not dress weather appropriate, but that was my negligence. Regardless of the rocky start, I much enjoyed this class time. Thoreau’s cabin reminded me of the Tiny house social movement. I have watched many videos and read articles about this moment. Many times these tiny houses are off grid, allowing people to travel with their homes. Small houses also encourage people to be outdoors, something I think everyone should do more often. Overall, the idea of living with only the essentials in a small space fascinates me. I believe society attempts to reconnect with nature by living a simple life. It’s a hard concept to grasp for many people. This concept of living in a small space with only the bare necessities can be daunting to many. For me, it seems like a perfect balance between nature and modern life. 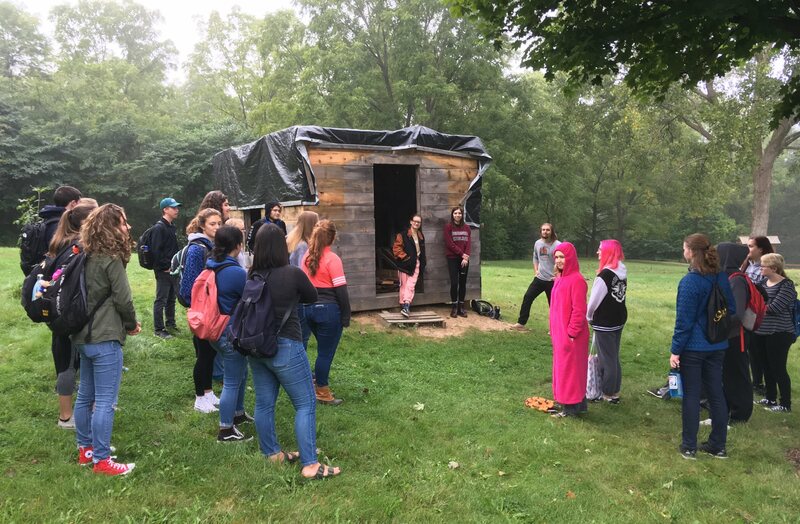 Our thanks to students from Prof. Ed Gillin’s course as they explained what it’s like to construct a replica of Henry David Thoreau’s cabin. Planing, notching, scrounging, organizing—a lot of work has gone into this simple structure! Visit the Thoreau-Harding Project website to learn more. It is a wonderful feeling to realize that you have met someone that you can be authentic around. I met that person two weeks into entering college. We both felt the connection and I knew I found a true friend. We have spent many hours during the night having extended conversations about anything and everything that we want. We share personal secrets that not many other people know about us. One topic we both have found ourselves talking about somewhat often is the type of weather we enjoy the most. Having both been from Long Island and having our view of stars be somewhat limited, the first time we went on a walk at night was unforgettable. We could each see three times as many as we were used to seeing back home. We basked in the glory of it and then continued our walk, stealing glances at the sky twinkling lightly back at us. Moments like those and the conversations following is how I explained that anything to do with the sky has always fascinated me. Sunrise. Sunset. Clouds. Sheets of rain. The moon and stars. Anything! I adore seeing how it can look different every single time I see it. He would tease me for how excited I would get any time the sky changed colors or I saw the moon for the first time that night. Regardless, it would place a large smile on my face and make me want to jump up and down, screaming about how much I love the sky. He began to tell me that one of his favorite types of weather to see is fog. He gushed about how fog is so unique and interesting. We discussed how many emotions the fog alone can evoke in a person. In the Tesla house we take the Nature Writing class which Geneseo offers and it has honestly been a very new and exciting experience so far. First of all, sometimes we go outside during class, which has been really fun with all of the warm weather. It is a very interesting take on writing, and I have enjoyed the class so far. It is interesting in that you have to look at nature in new ways and notice more. Who doesn’t love getting stuff in the mail? Since I’ve started living here at Geneseo, I’ve gotten quite a few deliveries. For example: the belts I forgot at home, new running shorts, shower shoes, and a 10-inch apple-sour cream-walnut pie. Yes, you read that right. I really did receive a pie with that many key components. Well, as I stared at the pie taking up the entire top shelf of my fridge, I started to hatch a plan. 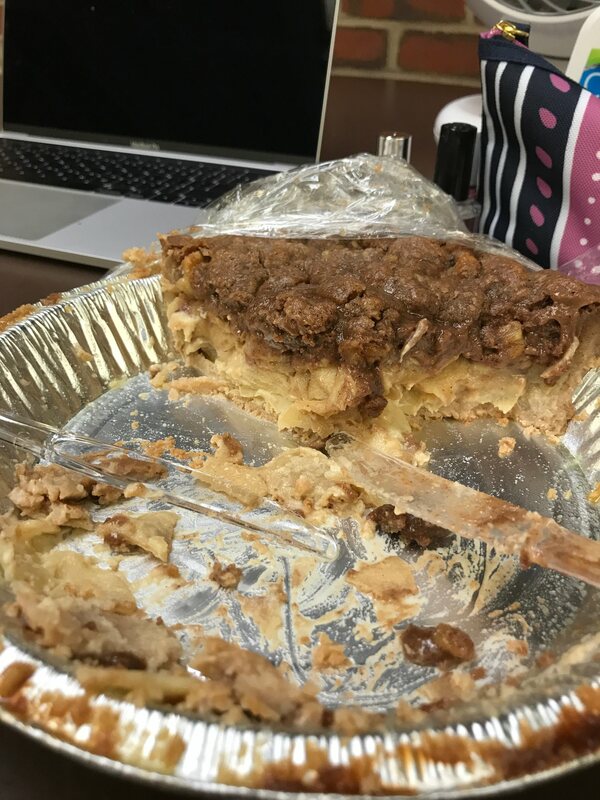 This pie would have get eaten by the power of college students’ insatiable appetites. Slowly, the hungry folk of my building came trickling in. A new face sat down with us and told us it was his first time ever eating apple pie. Three energetic friends used their slices as energy for their study-break dance party. A gaggle of guys rambled in and requested big pieces, to which we happily obliged. Eventually, one of our RA’s came down to take the final slice. Welcome to the Nature Writing blog, a space where members of our Fall 2015 writing seminar occasionally will share portions of works-in-progress, responses to course readings, provisional ideas: the daily work of paying attention. 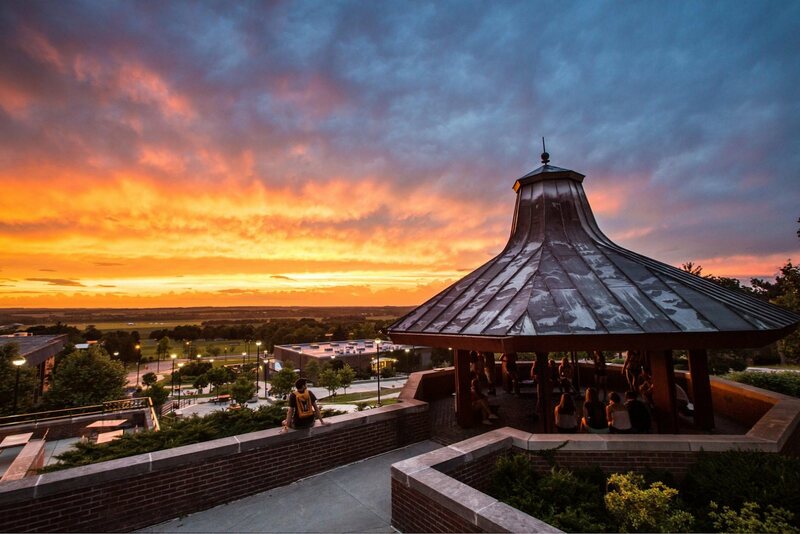 Although Geneseo is surrounded by natural beauty, some of the places we’ll write about don’t fit necessarily fit into that familiar aesthetic. But as Jenny Price has written of rivers re-engineered into “concrete flood control channels,” they no longer look “wild enough to be a river or to count as nature at all,” and so really the first step is “to see the nature in the place. You have to find it.” And that’s where we’ll begin! 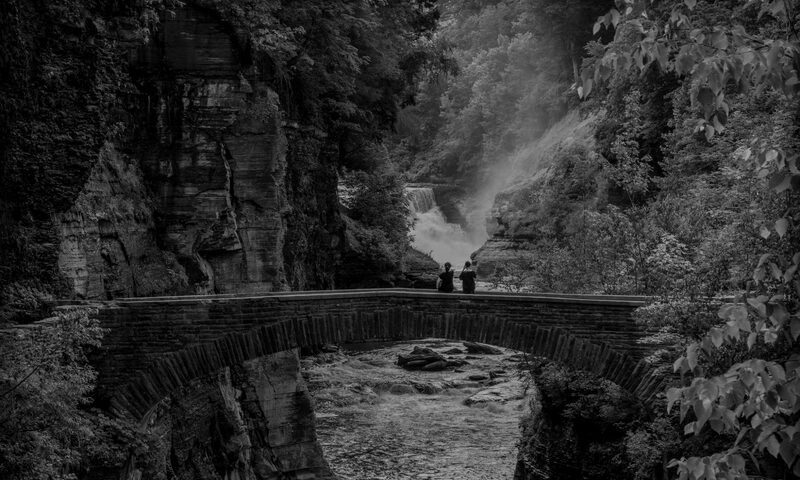 –Ken C.
Header Image Credit: Letchworth Lower Falls 7320. Photograph by Kim Carpenter [CC BY 2.0], via Flickr.